Cambodian Prime Minister Samdech Akka Moha Sena Padei Techo Hun Sen, Vice President of the ruling Cambodian People’s Party (CPP), and the main Opposition Cambodia National Rescue Party (CNRP) President H.E. 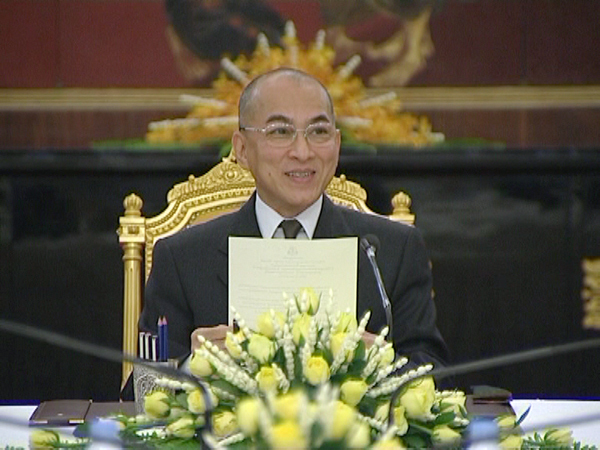 Sam Rainsy on Thursday afternoon led their delegations to pay their courtesy call on and report to His Majesty Norodom Sihamoni, King of Cambodia, about the July 22 political agreement. 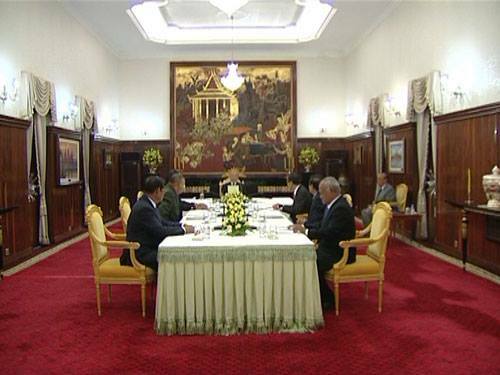 According to the National Television of Cambodia, the delegation from the CPP included H.E. Say Chhum, First Vice President of the Senate and Chairman of the Permanent Committee of the CPP Central Committee, and H.E. 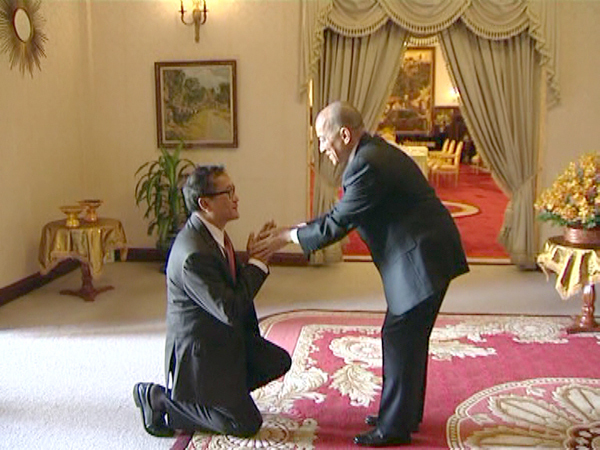 Sar Kheng, Deputy Prime Minister, Minister of Interior, and Permanent Member of the CPP Central Committee. The components from the CNRP were H.E. Kem Sokha, Vice President, and H.E. Pol Ham, Standing Committee Chairman. On the occasion, Prime Minister Samdech Techo Hun Sen said it was a great day that the leaders of the two parties paid a courtesy call on His Majesty the King to report about the remarkable outcomes of the political settlements for the interests of the country and people as a whole. Prime Minister Samdech Techo Hun Sen touched upon many tasks to be carried out in the future such as the re-organization of the National Assembly’s leadership, the Constitutional Law amendment, the modification of the electoral law, and so forth. H.E. Sam Rainsy said CNRP would continue to involve in solving all national issues while the lawmakers would attend swearing-in ceremony and start their work at the parliament. His Majesty the King highly appreciated the agreement reached by both the CPP and CNRP through the negotiations on July 22 to end the year-long political crisis. The Cambodian monarch also urged the leaders of both parties to sympathetically collaborate with each other and join hands to solve major issues for the national benefits, peace, and stability – all serving as the groundwork for the national progress and dignity.